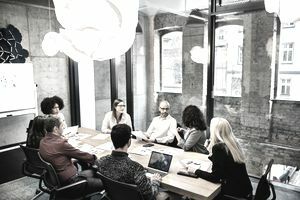 In marketing, advertising, product design, the film industry, and many other professions, a focus group is often used to test the possible effectiveness of a product or campaign. Basically, it's a group of people, from different backgrounds, assembled to participate in a moderated discussion about a particular product, service or advertising campaign. It will either be used to gain insights before work has started, or used to judge and guide the work being done. Often despised by the creative department, and loved by the clients, the focus group is often seen as a way to justify the expense of an upcoming advertising campaign by getting actual consumer feedback before it launches. However, this research is often best taken with a huge grain of salt. As you will discover, it can give credence to something that will actually fail once it hits the market, or stop something in its tracks that was actually destined to be a huge hit. Moderated groups: As the name suggests, a trained moderator controls the focus group. Most focus groups are done this way. Unmoderated groups: Highly discouraged, the client or agency can simply put a product or service in front of potential consumers, and take notes from behind a two-way mirror. In these cases, a respondent often steps up and becomes a proxy moderator. Client-based focus groups: The client participates in the focus group, either openly or undercover, to get feedback first had. Opposing moderators: In this scenario, two trained moderators participate, each taking a different view of the product or service being discussed. Remote teleconferencing: An audio or video network is used to create a focus group connecting clients, agency staff and respondents across the country, or even the world. Online focus groups: One of the most cost-effective new methods, a virtual group is created using the Internet. An online moderator controls the group interaction. When doing initial research for a product or service, focus groups can be invaluable. Although the information is subjective, it can assist in product development, new service improvements and avenues for advertising agencies to explore. By learning as much as possible about what the consumers think of a product or service, you are gaining valuable insights that can help ad agencies develop strong campaigns. The main drawback is the "one in a million" outcome of the groups. No two focus groups are alike, comprising different people of differing backgrounds and ages. But even if focus groups used the same people every time, attitudes to products and services can change overnight. How people feel, what is going on in their lives, and many other factors can affect the outcome. So it's never consistent. The "easy to please" factor should also be considered. Many people find it difficult to be brutally honest, and will often just give moderators the answers they think they should be giving. Cherry-picking respondents who are biased towards the product or service can exacerbate this. And of course, one of the biggest problems of focus groups is trying to please all the people, all the time. If ad campaigns do not offend anyone in the room, or even cause a fiery discussion, then they are considered good. But that's counter to what advertising is supposed to do. Creative, disruptive advertising is designed to catch the attention, and will never please everyone. This type of advertising will rarely come through a focus group unscathed. As Henry Ford once famously said, "If I had asked people what they wanted, they would have said faster horses.” Knowing this, you really have to be careful with a focus group. One way or another, It could cost you a lot of money.